Jerry McClellan Sr. is a multi-talented professional working within the creative industry. He has earned a Bachelors in Communication Arts from Loyola Marymount University. In addition to writing, Jerry currently works as a Web Designer/Developer for a tertiary educational institution in Southern California. Over the years Jerry's career has spanned across many industries, starting as a freelance graphic designer, he has worked in newspaper advertising, direct mail marketing, packaging design, automotive advertising, real estate marketing, and real estate investment, with several years in talent management as a talent recruiter and acting coach. Filling various roles from graphic designer, art director, and marketing consultant to copywriter/copy editor. His many clients and employers have always found him to be an easy going, hard working individual who works well in high-pressure environments and excels at taking the lead of a project. Along with being a busy husband and father of two, Jerry has also provided charitable work such as free creative web services for the South African Well Project; He has also volunteered with the West Los Angeles C.O.G.I.C. prison ministry for the last 7 years, bringing fellowship and encouragement to inmates seeking a second chance. In addition, Jerry also volunteered as an after-school coordinator for the non-profit group BOND (Brotherhood Organization for a New Destiny) for several years, mentoring at risk Junior High/High School teens with timely advice, encouraging them to overcome personal issues to achieve excellence in school and at home. Jerry continues to seek opportunities to volunteer his time and talents to make a difference for others. Jerry has been a fan of animation for as long as he can remember, including anime, and fell in love with 3D animation at his first exposure to an old Saturday morning series called ReBoot. He is also a fan of comics, and is a huge fan of the DC Animated Universe! Jerry has always had a knack for writing, even starting his own blog years ago called “Truth Be Told”. This lead to a growing fascination with writing for animation. After realizing a growing demand for fresh, new, and minority characters in the science fiction/fantasy/superhero genre, Jerry felt it was time to create a new universe of characters that would meet these demands, Fantastic Dimension was created. He has worked on Fantastic Dimension for over seven years now, regularly expanding the universe and adding new, interesting characters. At this point there are well over 50+ diverse characters within the Fantastic Dimension Universe, and steadily growing! 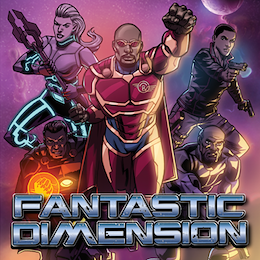 After sharing the Fantastic Dimension script and slate of characters with MPMG and Outland Entertainment, they agreed to partner with Jerry to help develop a graphic novel and animated series for television to bring the entire Fantastic Dimension Universe to life for the rest of the world to enjoy!